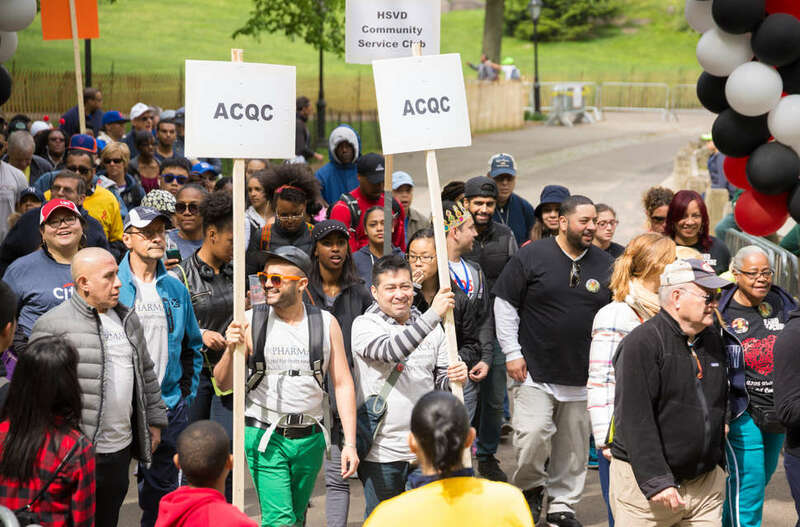 On Sunday, thousands of people will gather in Central Park to walk or run the annual AIDS Walk New York in support of the Gay Men’s Health Crisis (GMHC) and other local organizations that support people and families living with HIV and AIDS in the tri-state area. On May 20 in Central Park, rally with a team or go it alone to support people living with HIV and AIDS and to fund crucial research. You can run a 5K, or walk a 10K -- with plenty of fanfare to keep spirits high. 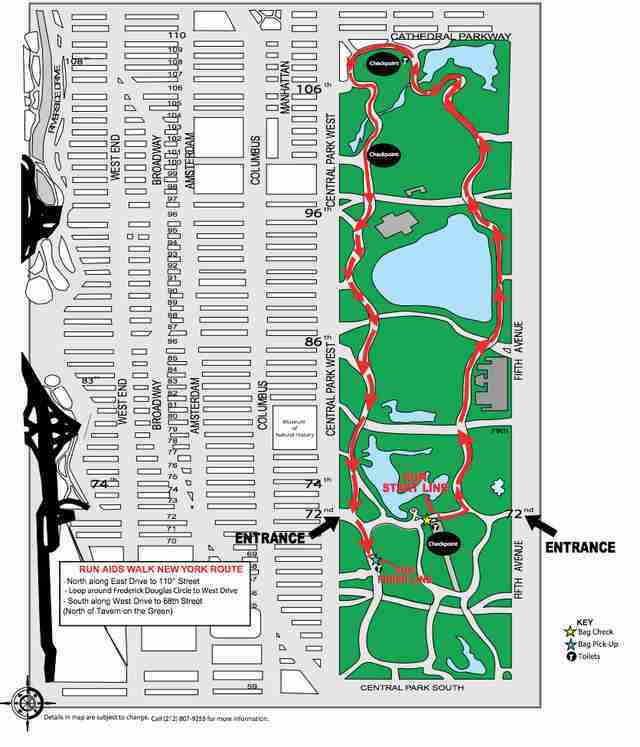 Where will the AIDS Walk NYC take place? The walk begins in Central Park near the entrance at 72nd Street and Fifth Avenue. Check the official AIDS Walk map before you go. Day-of registration for the event will begin at 8:30am at the starting line. At 9am, volunteers will lead walkers and runners in an aerobic warm-up, and at 9:15am, the opening ceremony will begin. Activist celebs like Hamilton’s Javier Munoz, Hunter Emery of Orange Is the New Black, and Zachary Quinto of American Horror Story will take the stage before the walk starts at 10am. What is the route for walkers? Walkers will head uptown until they hit the park’s Northernmost edge at 110th Street. Here, they’ll hang a left, before heading South on Riverside Drive. At 74th Street, they’ll make another left, reentering the park at 72nd Street and Central Park West, finishing back at the starting line. What is the route for runners? 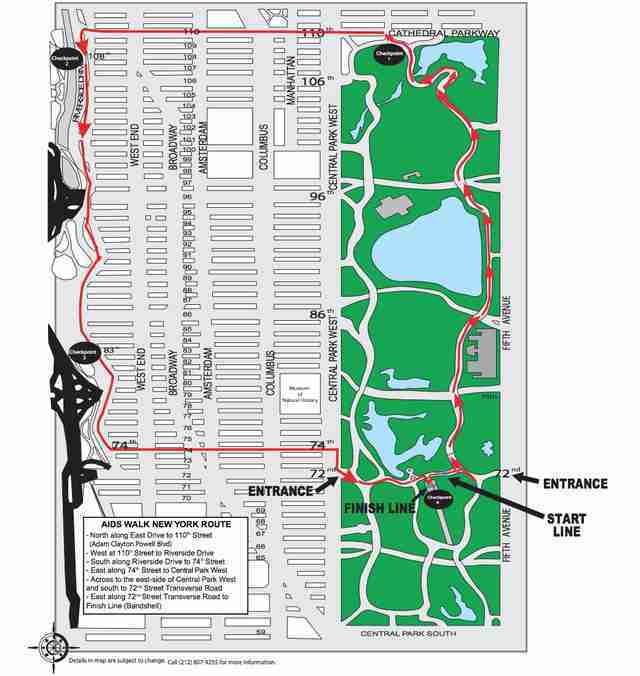 Runners will also head north from the starting line, but they’ll stay in the park, looping around Frederick Douglass Circle and continuing south on West Drive. The finish line is at 68th Street and West Drive. Can I participate if I haven't fundraised with a team? While plenty of teams have a head start on the fundraising front, your support is still welcome. Register online ASAP. Registration is free, you can march with a team or as an individual, and there is no fundraising minimum -- though now might be a good time to see if any of your friends are willing to pony up. Festivities kick off at 11:30am, when runners and walkers begin to arrive at the finish line. Expect live music from the Grammy Award-winning Pointer Sisters, and performances from RuPaul’s Drag Race stars. One catch: You’ll need to fundraise at least $200 for admission. So get to it. Virtual walkers are welcome to register and gather sponsors online and wear a red ribbon in solidarity. If you’d rather sit on the sidelines, you can sponsor a team, an individual, or make a general donation to the cause.